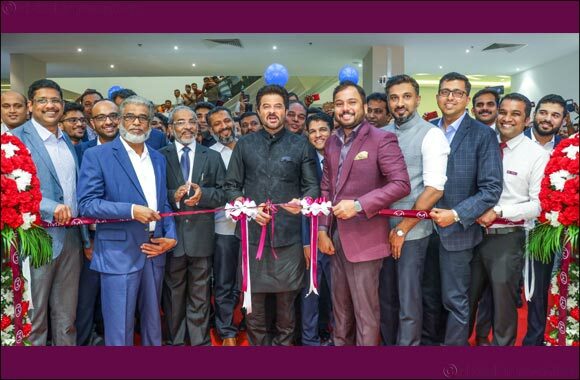 Bollywood actor Anil Kapoor inaugurated 2 new stores of Malabar Gold & Diamonds in UAE on Friday, 18th January, 2019. Dubai, UAE, January 20, 2019: Malabar Gold & Diamonds, one among the largest jewellery retailers globally with a strong retail network of 250 outlets spread across 10 countries launched 2 new stores in UAE on 18th January 2019. Bollywood actor Anil Kapoor inaugurated the new showroom in Grand Mall, Sharjah and Grand Hypermarket, Jebel Ali, Dubai in the presence of Mr. Shamlal Ahamed, Managing Director – International Operations, Malabar Gold & Diamonds, Mr. Mayinkutty C, Senior Director – Malabar Group; Mr. Ameer CMC - Director – Finance & Admin, Malabar Gold & Diamonds; management team members of Malabar Gold & Diamonds, other dignitaries, well-wishers and invited guests. Both the events were witnessed by a huge gathering. The company expanded its presence in UAE by opening 2 new stores in a day. “Our core business values such as transparency, quality along with our value added services, product designs that suits every class of customers’ taste cutting across age group helps to give us a global acceptance. In the new year 2019, we already opened 6 new showrooms as well as manufacturing units as a part of expansion plan. This will fuel our vision to become the top jewellery retailer in the world.” said Shamlal Ahamed, Managing Director – International operations. The showroom launches has taken place amidst the grand Dubai Shopping Festival promotions. Customers of AED 500 worth gold jewellery will get a raffle coupon to win gold prizes and the customers of AED 500 worth diamond jewellery will get a raffle coupon for the BMW car draw. The promotions are valid in all Malabar Gold & Diamonds outlets in UAE and Dubai Gold & Jewellery Group’s participating outlets. Both the outlets has unveiled a significantly large collection of traditional as well as contemporary designer jewellery. The new showrooms showcases the exquisite collection of gold jewellery in 18K, 22K and 24K alongside Diamond, Uncut diamond and precious gem jewellery handpicked for the jewellery lovers in UAE. Malabar group offers exquisite and beautiful jewelry as a part of various brands presented at Malabar Gold & Diamonds’ namely Ethnix - Handcrafted Designer Jewellery, Era - Uncut Diamond Jewellery, Mine - Diamonds Unlimited, Divine- Indian Heritage Jewellery, Precia - Gem Jewellery and Starlet - Kids Jewellery.